I built this model a long time ago, my best guess is sometime in the summer of 2001. I finally finished it several years later after several revisits to enhance or correct as my knowledge of the plane and its operations improved. As best as I can recall, construction went smoothly. I knew I had to be careful as I wanted a good build on which to paint the NMF. I don’t recall using any filler, but I must have because I use it on all my kits. One thing I wish I had done, was to fill all the panels lines on the wings as Mustang wings were smooth. I didn’t, and don’t plan to now – I’ve reworked this model enough times already!. As I recall, I used SNJ for the NMF on this kit. It was my first use of this paint and I liked it very much. 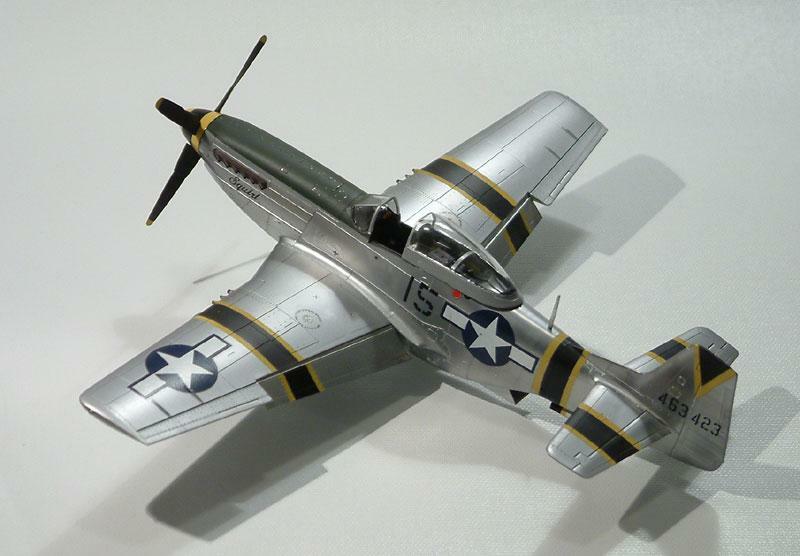 I also wish I had used a different paint – Floquil Old Silver, for example – on the wings to represent that they were not in fact NMF, but were painted with an aluminum lacquer. Following the NMF painting, I masked the ID stripes with Tamiya tape and painted them. Veterans of the 47th FS say, to a man, that the darker portion of the stripe was dark blue or purple. Most references however say the colour is black. If I had known about the blue/purple at the time of painting, I would have done it that way because it would have looked cool; but I chose black. 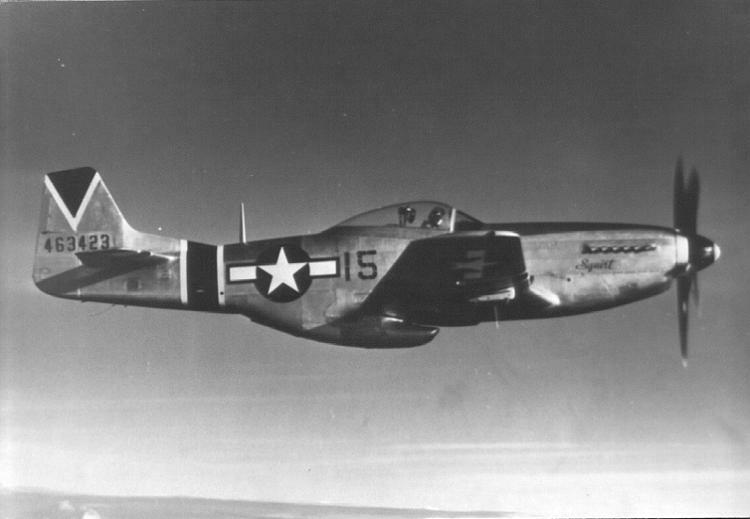 Col. Beckwith took a machine of the 47th FS as his personal aircraft, hence the markings on “Squirt”. I chipped the paint a little on the stripes to simulate wear. Finally, I hand painted the rear wall of the wheel well with YZC as the main spar on the Mustang was generally painted this colour, while the rest of the wheel well was painted with aluminum lacquer. The decals were from the kit and I cobbled the numbers for the serial number and squadron from the spares box. It wasn’t until months later when I learned how to make decals that I was able to finally add the “Squirt” to the port side cowling. 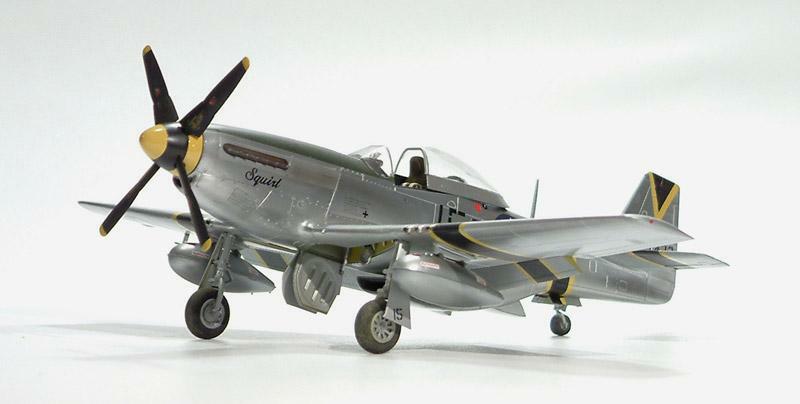 Following correspondence with Mark Stevens (http://www.7thfighter.com/) in the course of putting this article together, I learned that “Squirt” was actually painted on both sides of the cowling, as well as having a repetition the ID number on the main undercarriage doors. I dug around in the decal spares box and was happy to find some more of the “Squirt” decals I had made a year previously – one of which I applied to the starboard side cowling – and then with addition of the small “15” to each undercarriage cover (parallel to the ground per the reference photos) I [finally] completed the decaling. I kept weathering to a minimum. There is some chipping on the theater stripes and slight exhaust staining and addition staining from the oil overflow vent on either side of the engine which I applied with the airbrush using Tamiya Smoke. I used pastels to dust up the undercarriage and undersides – though that is a little difficult to make out in the images. 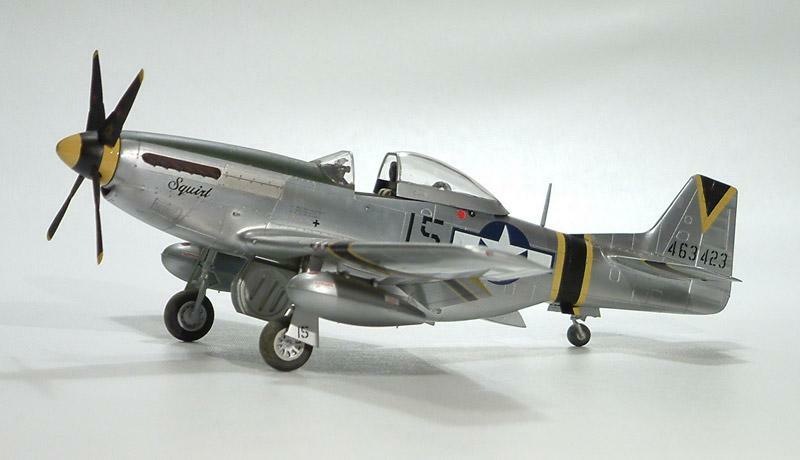 Col. Beckwith’s P51 “Squirt” 463423 was destroyed on April 24, 1945 when a crippled B29 returning from a mission over Japan crash landed and plowed into several 15FG P51’s, destroying them all in the resulting fire. 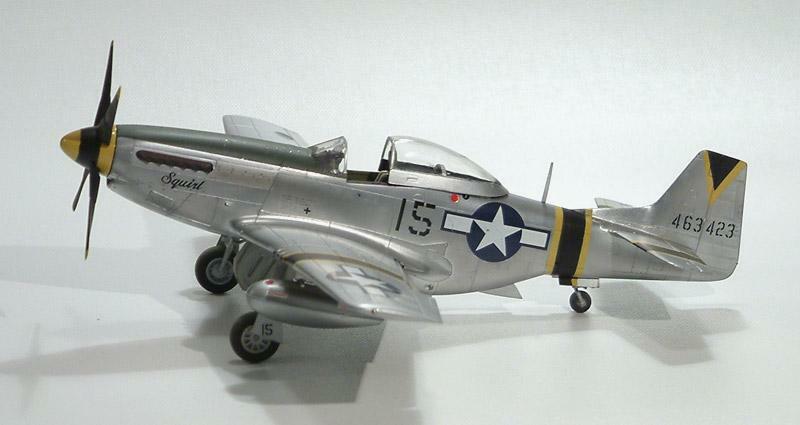 A very nice looking Mustang you have built there Mark. With the weathering kept to the minimum , it gives the impresion of a Colonel`s mount. Well, I did put Tamiya 1/48 in the Tags at the bottom of the article 😉 but yes, you guessed right anyway. That’s what I call a long-term project! I have a house-rule that says that as soon the model has entered the display cabinet there will be no more fiddling-around with it 🙂 ! You’ve definitely got a nice touch the finishing and subtle weathering, Mark, I like this one as well. I really like this. You have done a very nice job with this. Great finish. 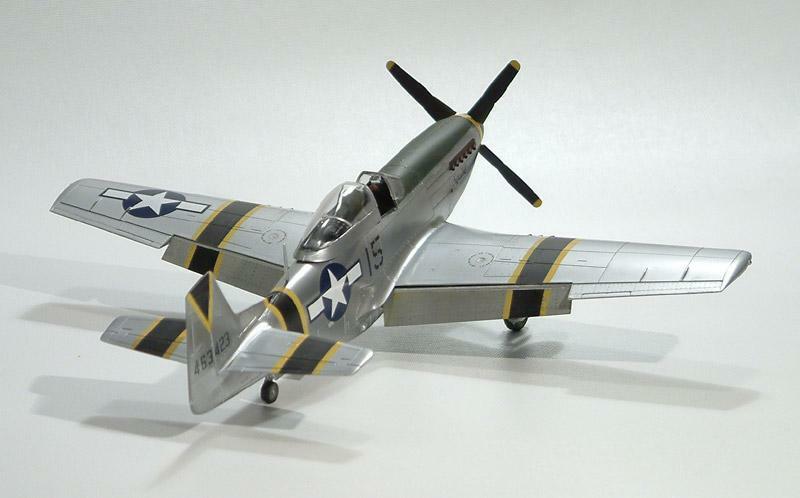 I really think the Tamiya P-51 D and B are the best all around 1/48 kits. At least that is my opinion and yours is a fine example to back up my opinion. 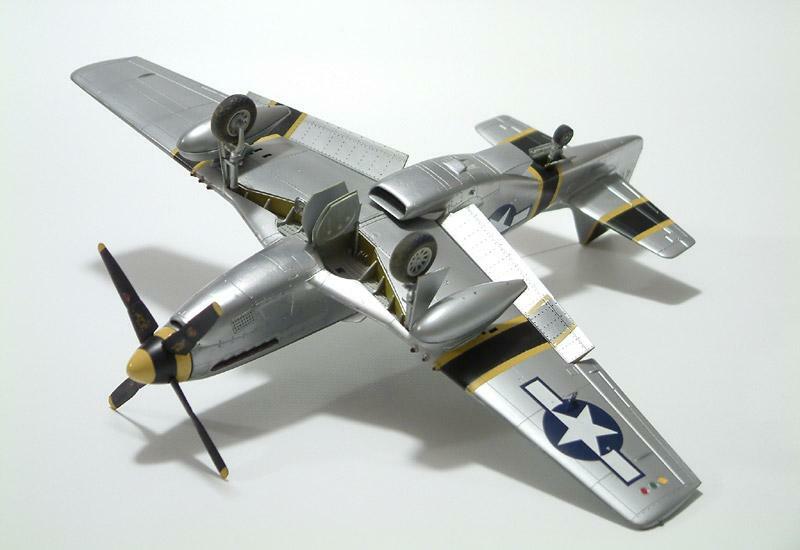 Mark, great model/finish….no points will be deducted for not painting the wings aluminum lacquer! For Rob’s B17G theme. Mine, built a few years ago. Gloster F 3 Meteor, A77-1 / EE427, 1 AD RAAF Laverton Vic 1946.